We all agree that a cookware is very important kitchen appliance that we use every day. Having a good quality cookware set allows you to cook any kind of food easily. The fact is that the number of cookware brands seems increasing every day. There is a wide range of pots and pans that made of a varying material such as stainless steel, aluminium, to copper and iron cast. Moreover, there are different types of cookware from two and more different metals. With all these in mind, it is not easy to choose that right cookware that we need. As far as popular cookware bands are a concern, All-Clad and Tramontina are two favourite brands that have been used by millions of household in the US and the rest of the world. However, both brands offer high-quality cookware that makes a comparison between Tramontina vs All Clad are difficult. These two bands are very well-known cookware brand that has been around for a long time. Today we are going to examine and compare both cookware brands as well as other brands like Demeyere and Cuisinart. As we all know that Clad and Tramontina are two popular cookware brands that compete with each other for long periods of time. Both brands have their own fanatic fans who involve internet debate to claim that their favourite brands are better than the others. Both of fans may be true as each of brands has their own advantages and disadvantages. Tramontina vs All Clad has become an interesting topic to discuss. All-Clad Cookware is a well-known cookware brand that introduces multi-clad cookware. The idea was to place different types of metal layering to each other. This multi-clad cookware has become favourite cookware as most families in the US use this kind of cookware. All-Clad Cookware offers high-quality cookware that combines various features such as a light-weight, low cost and provides excellent heat distribution for all their cookware. 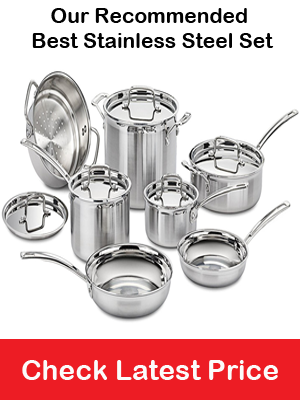 Remember that All Clad cookware is made of aluminium that has a durability of stainless steel. Today, All-Clad still considered the best cookware brand in the US. Also, All-Clad cookware made from 5 layers of metals that offer a unique blend of durability, strength, and weight as well as heat conductivity. Additionally, magnetic steel alloy is added to the base for better induction. For the purpose of longevity, all construction is made of metal. With proper care, this cookware will last for a decade. Some happy customer claims that they’re All clad still performs well even they had bought it 30 years ago. Most of the All-Clad cookware made of stainless steel, and they don’t have nonstick material coated on it. Therefore cleaning is sometimes a bit difficult as your food occasionally sticks to the pan. This is true especially if you are not diligent when cooking and cleaning stainless steel cookware. However, the overall performance of this particular cookware is excellent. All-Clad cookware equipped with non- reactive surface that makes cooking safer. With a wide range of brilliant features, All-Clad cookware has become cookware of choice for many American families. However, All-clad is not cheap as this cookware is also covered with lifetime warranty. We have mentioned earlier that many cookware manufacturers produce high-quality cookware. One of the favourite brands for cookware is Tramontina Cookware. At first glance, pot and pans produced by Tramontina have similarity with All-Clad. They are not precisely the same, but there is more similarity than the differences. Both exteriors have mirror polished and constructed from more than two layers of metals. All-clad has 5 layer metals constructions while Tramontina has 3 layers of different types of metal construction. Another similarity is that both brands offer good heat distribution, low weight, suitable to cook acid food and dishwasher safe too. So, both brands are actually offering the best cookware feature that we need. Now we are going to examine the differences between Tramontina and All-Clad. All-Clads is oven safe up to 600 F while Tramontina Cookware is only safe up to 350 F. So in this matter, All-Clad is better than Tramontina. So, if you don’t want to buy Tramontina and you want to find Tramontina alternative you can buy All-Clad or another favourite cookware brands that offer a better feature that you need. Another well-known brand for cookware is Demeyere. Demeyere pronounced as de-MY-ruh has been around for more than a century. This particular brand is not the only popular for its cookware product but also for its high-quality kitchen tools. As far as cookware product comparison is a concern, All-Clad and Demeyere can be compared in many aspects of their product features. However, we will pick up their feature on how they can withstand on the heat. As we mentioned earlier that All-clad is able to stand heat up to 600 F. Demeyere, on the other hand, has more clever ideas. Demeyere offers a smart feature. When the temperature reaches up to 250°C/485°F the inductors will decrease gradually and stabilize between 250°C/485°F and 245°C/475°F. So, the comparison of All Clad vs Demeyere shows that All Clad can stand heat more than Demeyere. Many cookware brands offer a high-quality product that adopts latest and sophisticated technology. These kinds of cookware are very popular in society. However, it is very important to choose the right cookware that suitable for your need. Remember each brand have their own cons and pros. Some people are still debating about their favourite cookware. If you search Tramontina vs All Clad on the internet, you will find a very interesting debate about these brands. Just read them to help you to make up your mind and choose a brand that you like. I hope this information useful, and please do share this with your families and friend.